In addition to central heating in your home, there are a few options to keeping warm this winter. Just make sure you are familiar with the manufacturer's instructions and use these items safely. Propane and kerosene heaters. Inspect the exhaust parts for carbon monoxide buildup and be sure the heater has an emergency shut-off in case the heater tips over. Make sure the room the heater is in has plenty of ventilation. Burning fuel such as kerosene or propane can produce deadly fumes. Keep kerosene or other flammable liquids stored in approved metal containers outside of the house. Wood stoves. Be sure the wood stove is installed properly. It should be 3 feet from combustible surfaces and have proper floor support. The stove should be burned hot twice a day for 15 to 30 minutes to reduce the chance of a chimney fire. Electric space heaters. The use of space heaters or portable heaters is growing because they are economical and easy to use. Although portable heaters are designed to be safe, if used improperly, they might cause fires, burns, explosions or electric shock. Space heaters should be at least 3 feet from furniture, walls, bedding, etc. and should never be left unattended. Look for a listing by a testing lab to insure certain safety standards. Look for space heaters that have automatic turn-off switches should the heater get too hot, and that will also turn off the heater if it tips over. Don't use your heater as a dryer. Keep clothing and other combustibles a safe distance away. Fireplaces. Choose the right fuel. Hardwood such as oak and hickory burn cleaner than softwood (pine, cedar, etc). Never burn wrapping paper or glossy magazine paper, which can cause an explosion. 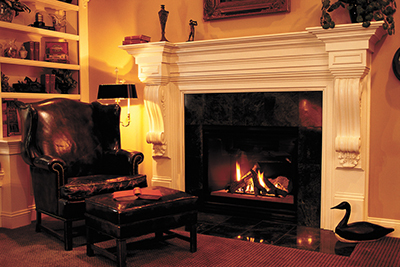 Keep your fireplace in good condition. Have the chimney inspected for cracking or deterioration. Repair any loose mortar or bricks. Clear the area around the hearth. Always keep a glass or metal screen in front of the fireplace opening. Never overload the fireplace with too many logs, and stack the logs at the rear of the fireplace when building a fire. Never close the damper until you know the fire is out. A closed damper will help the fire to heat up again if there are hot ashes and will force toxic carbon monoxide into the house. Stay safe while you're staying warm this winter. Cinda Seamon is the fire and life safety educator for the Town of Hilton Head Island Fire & Rescue.